4thehokies has no other items for sale. Take familiar characters on a journey through a new universe filled with cutouts in Paper Mario for the Nintendo 3DS. 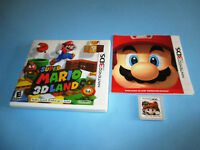 This version of the Mario game series is specifically designed for the portable console. It features turn-based combat and introduces the concept of stickers. This video game places more emphasis on the "paper" aspect of the series than previous games. Notice fun status elements that relate to paper materials like "clipped" and "soggy" while world elements resemble craft materials. 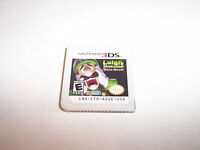 This 3DS game is set in the town of Decalburg, where Bowser has played a prank that has disrupted Sticker Fest. Unfortunately, his trick has sent pieces of a comet and six Royal Stickers throughout the world. It is up to Mario and Kersti, his fairy sidekick, to recover them and set everything right. Along the way, you encounter familiar enemies like Goombas, Piranha Plants, Hammer Bros, Koopa Troopas, Shy Guys, and Bob-ombs. In this game, some enemies assist others before entering the fight with a unique animation. Unlike the first two Nintendo Paper Mario games, this game does not give Mario a partner to fight with him. You also notice an absence of Experience Points, Star Points, Flower Points, Items, and Badges. Mario journeys through six different worlds to gather all of the Royal Stickers with one sticker in each world. Throughout his journey, he gets help from a team of allies, including familiar faces like Toad, Princess Peach, and Luigi. To increase his maximum health, Mario finds HP-Up Hearts throughout the game.Players use their stylus and touch screen to help the two-dimensional protagonists navigate their way through a variety of three-dimensional worlds. Mario collects and uses stickers representing classic power-ups like the frog suit and fire flower. There are also plenty of new items like large fans, radiators, and scissors. Mario uses stickers to attack rather than use a traditional attack menu. Players pick up coins during play for use in the Battle Spinner. The Battle Spinner is a slot machine that gives you a chance to unleash three different sticker attacks per turn. In true role-playing gameplay style, Paper Mario characters get stronger by finishing side missions and defeating bosses. He also needs to complete puzzles in Sticker Star with the right sticker and find items to advance.“Paper Mario: Sticker Star” was developed by Intelligent Systems for three years before its release date of November 11, 2012. This one is the fourth installment in the series but the first of the Paper Mario games for a handheld console. This 3DS game is a one-player game that requires a Nintendo 3DS to play. As with other Mario games, this installment has a rating of E for everyone. With its new take on a classic game, it is sure to be a hit with children and adults alike. 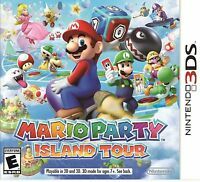 This is a great game for Mario fans. I have played a lot of Mario across many different platforms, and this one is different from all the rest. Most Mario games involve well timed jumps to destroy enemies. In this game, you use strategy and battle in a turn-by-turn style. Many different worlds you can work on at once, not a linear exploration like in other Mario games. You also have to use items you find in one world to complete other worlds. Very mentally stimulating, great game play experience. Would recommend for older children and adults. Not as good as thousand year door, but good nonetheless. It is somewhat true that this is quite a bit weaker than its GameCube counterpart. It lacks strong story elements, party members, and a form of leveling up (besides the hp up hearts you can find throughout various worlds). But, considering that this is a game for a portable game console, it does pretty well for itself. 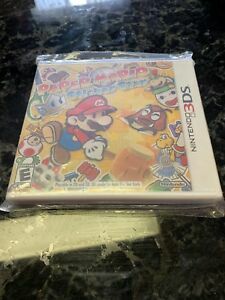 I’m not sure I would call it a must have, but if you enjoy Paper Mario in general, I would strongly recommend this game. The 3d graphics really help the paper world come to life, as things unfold and peeled away. The battle system is a unique feature compared to other rpgs, as you use stickers you find as your battle commands. One negative I had is that it can be tricky in long boss fights when you need certain stickers you may or may not have in your inventory. I eventually had to resort to looking online for solutions to boss fights, which alleviated that frustration. Other than that, it's a great game! 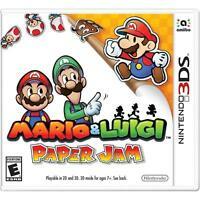 If you have played the previous versions of Paper Mario and own a 3DS, get this game you will not be disappointed. The gameplay is fun, the story is interesting and it's just another hit by Nintendo. Highly recommend it for any Paper Mario series fan. Happiness in a square...or mushroom! My six year old son loves this game! Although there is alot of reading, he could still figure out what was going on..